Syrian general whose miraculous recovery from leprosy is told in II Kings v. The name, meaning "pleasantness," is held by Lagarde to represent Adonis, on the assumption that (Isa. xvii. 10) means "the plantings of Adonis." Naaman was a distinguished general who had often led the Syrians to victory. Stricken with leprosy, he was advised by a captive Israelitish maiden that the prophet Elisha could cure him. Naaman accordingly asked the Syrian king's permission to go to him, but the king, misunderstanding the words of the captive maiden, gave Naaman a letter to the King of Israel requesting him to cure Naaman of his leprosy. The latterwas troubled by the Syrian king's message, and Elisha advised him to send Naaman to him. Arrived at Elisha's door, Naaman received word from Elisha that if he would bathe seven times in the Jordan he would be cured. Naaman was greatly disappointed, as he had expected that the prophet would meet him in person and implore Yhwh to cure him, but his servants persuaded him to follow Elisha's behest, with the result that he was completely restored to health. He then returned with his retinue to Elisha, before whom he acknowledged Yhwh as his God and asked for two mules' burden of Israelitish earth that he might build an altar to Yhwh. 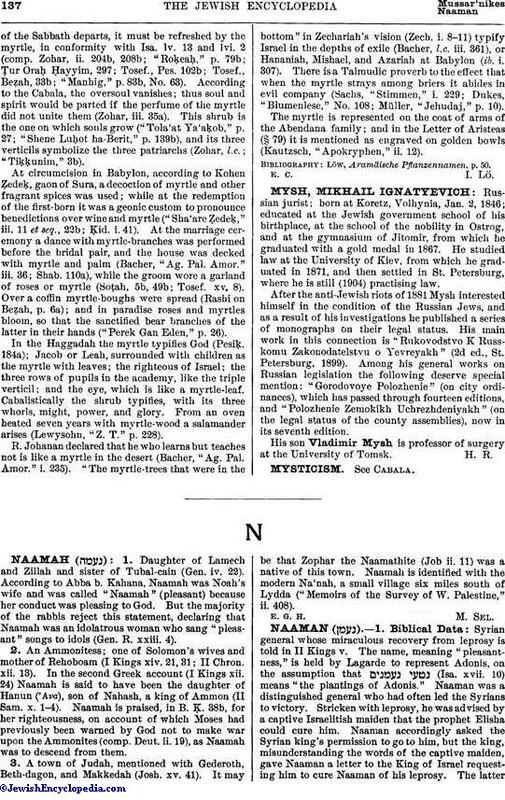 Naaman also sought forgiveness of Yhwh for his involuntary adoration of the Syrian divinity Rimmon through the act of his master in leaning upon him during his devotions. See also Gehazi. According to the Rabbis, Naaman was the archer who drew his bow at a venture and mortally wounded Ahab, King of Israel (I Kings xxii. 34). This event is alluded to in the words "because by him the Lord had given deliverance unto Syria" (II Kings v. 1), and therefore the Syrian king, Naaman's master, was Benhadad (Midrash Shoḥer Ṭob to. Ps. lx. ; Arama, "'Aḳedat Yiẓḥaḳ," ch. lxi.). Naaman is represented as vain and haughty, on account of which he was stricken with leprosy (Num. R. vii. 5; comp. Arama, l.c.). Tanḥuma, Tazria' (end), however, says that Naaman was stricken with leprosy for taking an Israelitish maiden and making her his wife's servant (comp. II Kings v. 2). Naaman is understood as Moab in the expression "Moab is my washpot" (Ps. lx. 8), which the Rabbis regard as an allusion to Naaman's bathing in the Jordan; the appellation "Moab" is a play on the word "abi" (= "my father"), by which Naaman was addressed by his servants in II Kings v. 13 (Num. R. xiv. 4). Naaman was a "ger toshab," that is, he was not a perfect proselyte, having accepted only some of the commandments (Giṭ. 57b; Deut. R. ii.). The Mekilta (Yitro, 'Amaleḳ, 1), however, places Naaman's conversion above Jethro's. As the object of the narrative of Naaman's sickness and restoration to health is, apparently, to form a link in the long series of miracles performed by Elisha, the redactor of II Kings did not concern himself to indicate the time when this event occurred. The rabbinical tradition that Naaman was the archer (I Kings xxii. 34) who mortally wounded Ahab seems to have been adopted by Josephus ("Ant." viii. 15, § 5). If the tradition is correct, the Syrian king whom Naaman served must have been Ben-hadad II. ; but as the interval between the death of Ahab and the curing of Naaman's leprosy is not known, it is impossible to identify the King of Israel to whom Naaman was sent with a letter. Ewald ("Gesch." iii. 552 et seq.) thinks the king referred to was Jehoahaz, while Schenkel ("Biblical Lexicon") suggests Jehu, but the general view is that it was Jehoram. 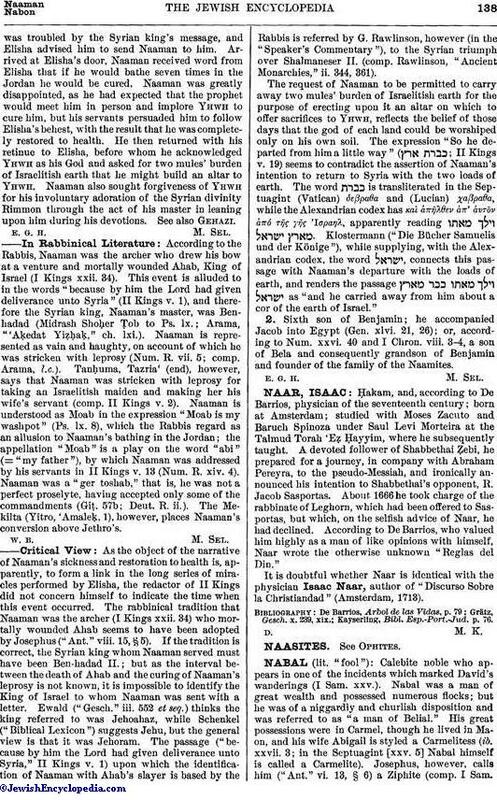 The passage ("because by him the Lord had given deliverance unto Syria," II Kings v. 1) upon which the identification of Naaman with Ahab's slayer is based by the Rabbis is referred by G. Rawlinson, however (in the "Speaker's Commentary"), to the Syrian triumph over Shalmaneser II. (comp. Rawlinson, "Ancient Monarchies," ii. 344, 361). The request of Naaman to be permitted to carry away two mules' burden of Israelitish earth for the purpose of erecting upon it an altar on which to offer sacrifices to Yhwh, reflects the belief of those days that the god of each land could be worshiped only on his own soil. The expression "So he departed from him a little way" ( ; II Kings v. 19) seems to contradict the assertion of Naaman's intention to return to Syria with the two loads of earth. The word is transliterated in the Septuagint (Vatican) δεβραθα and (Lucian) χαβραθα, while the Alexandrian codex has καὶ ἀπῆλθεν ἀπ' ἀυτōν ἀπό τῆς γῆς Ἰσραηλ, apparently reading . Klostermann ("Die Bücher Samuelis und der Könige"), while supplying, with the Alexandrian codex, the word , connects this passage with Naaman's departure with the loads of earth, and renders the passage as "and he carried away from him about a cor of the earth of Israel." 2. Sixth son of Benjamin; he accompanied Jacob into Egypt (Gen. xlvi. 21, 26); or, according to Num. xxvi. 40 and I Chron. viii. 3-4, a son of Bela and consequently grandson of Benjamin and founder of the family of the Naamites.